Every Production Plant produces waste material, both wet and dry. The Blovac range with its accessories has been developed for the collection of waste and small parts produced by many industrial processes – economically and safely. The Blovac rapidly removes metal swarf and chips from machine beds and floors. Waste can be collected in the dust bag or conveyed via a hose into a bin or drum. Tough body in Nylon 6 Resists abrasion. 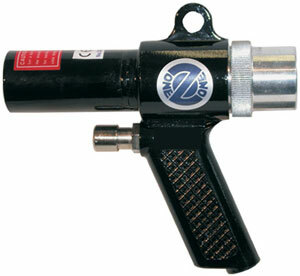 Connected to any air supply of 60 psi/8 cfm – or more, Blovac becomes a highly effective vacuum or blow-gun. Its unique venturi/vortex action will multiply the input many times, and prevents any risk of stalling when re-starting a laden gun. 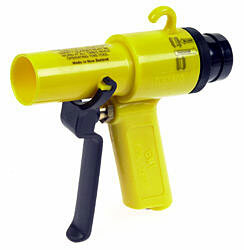 With no moving parts except a fail-safe on/off trigger control, and constructed in hard-wearing Nylon 6, it is highly durable and virtually maintenance free. Converting between blow or suction mode takes just a few moments. Simply unscrew the hose adaptor from the exhaust outlet, turn the venturi tube around and re-fit. Blovac’s 22mm diameter nozzle and high volume throughput enables it to tackle virtually any cleaning job in the factory or workshop. 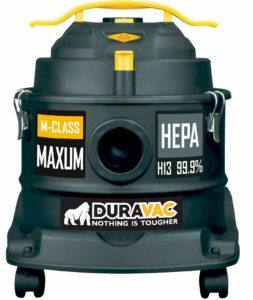 Oil resistant, chemically inert and electrically safe, it will clean up solid waste, dust and liquid spills. 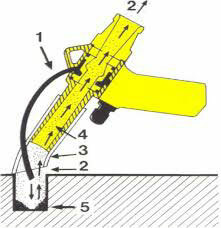 A special version designed for removing chips from blind holes up to 450mm deep. 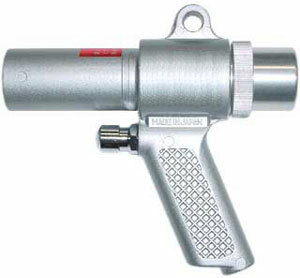 A plastic probe jets high pressure air into the hole to dislodge particles – which are safely sucked away by the main nozzle. 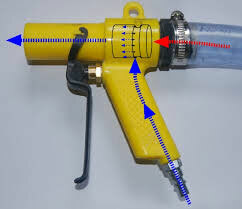 Nozzle is shrouded to prevent particles escaping and causing injury. 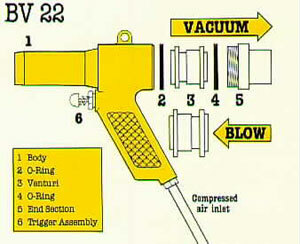 To avoid risk of injury, the gun must only be used with either the dust bag or conveying hose attached. Use to remove swarf and metal chips, sawdust, GRP and ceramic dust, bread crumbs and food particles, grain or seeds, windscreen glass, textile and paper waste – the list is virtually endless. Waste or recovered material can be collected in the dust bag or conveyed via the outlet hose into any suitable container – such as a vented fluid drum. 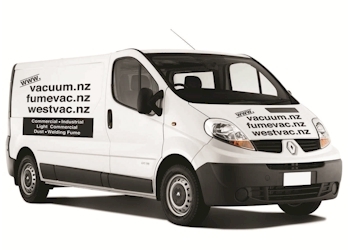 In the blow mode Blovac’s powerful air blast will clear dust from car bodies or furniture prior to spraying or finishing, or provide highly effective cooling. Blovac’s high power and swirling venturi action enables it to convey granular or powdered material rapidly over long distances. Using the smooth bore hose, polymer chips can be lifted up to 8M to feed an overhead hopper or carried up to 16M horizontally – at a rate of around 3.5 kilos per minute. Where water is present in the air supply, the installation of a moisture filter is strongly recommended.